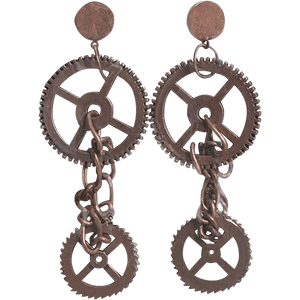 There is no questioning that wearing steampunk jewelry is a decidedly unique experience, one that we are eager to provide. And in order to offer you this intriguing experience, we offer a wide assortment of tasteful steampunk-styled jewelry. In a steampunk world, steam yet remains the dominant power and so the general style of the world at large is irrevocably altered slightly; gears are prominently featured in almost every technological work. And because they are so common, they are a celebrated aspect of many pieces of steampunk jewelry; in addition to the dozens of gears, cogs, and fly-wheels you will find decorating our steampunk jewelry, you will also find several other mechanical doo-dads that defy expectation and logic. Clock-work rings and winged sprocket medals sit proudly alongside technological marvels such as mechanical dragonflies made from gear boxes and metal bits. You will find propellers and chains and odd amalgams of technology co-mingling to create a style of jewelry that is all at once both antiquated yet pseudo-modern in look and theme. To some, steampunk jewelry is nothing short of esoteric. But to many, the word esoteric is just a compliment that defines how unique and strangely appealing our steampunk jewelry really is. The wrist is just another open place to adorn yourself with fancy techno-gadgets and do-dads when it comes to steampunk style! 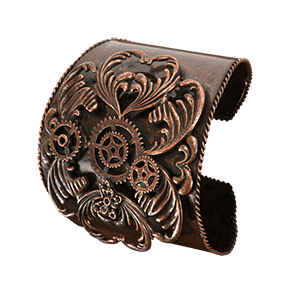 We have all the steampunk gear you could want, and in our steampunk bracelets section, all of it comes with the convenience of being worn directly on your wrist! Our steampunk bracelets come in two distinct varieties, with some being purely decorative and others mimicking the appearance of impressive pieces of steampunk tech. And those pieces that do mimic functional little bits of steampunk technology feature an impressive look that transcends visual appeal, often featuring moving parts or other interesting little bits that will leave others thinking you have an actual piece of steampunk technology! And even those that are purely decoration are rich with steampunk style, combining the typical elegance of Victorian fashion and form with the traditional steam-driven gears and cogs that typify steampunk style to create ingenuities and incredible bobbles and bits that will, assuredly, perfectly accent any enterprising Steampunk individuals style! And in spite of the category being defined as bracelets, you can rest assured that this is devoted purely to wrist and arm wear, meaning that men and women will find something they like here, ranging from bracelets to cuffs, to decorative arm bands that are perfect for a steampunk gentleman. Do you need a portable navitron to make your way through the hectic steampunk world? Or perhaps a stylish bracelet of steam wheels and cogs to accent your Neo-Victorian style? 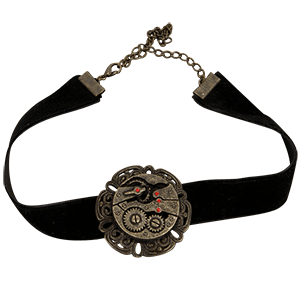 Well then, ladies and gents, boys and girls of all ages, step right up here, to the steampunk bracelets section, where we have just what you need to strap onto your wrist and venture out into that wide world of steampunk style! If you have on your Steampunk pendant and your goggles, as well as enough rings to cover your fingers and bracelets to swallow your wrists, are you out room to decorate yourself with Steampunk emblems? Why, no! There is still plenty of space on your vest, shirt, or coat lapel for one of our steampunk brooches and pins! Like any other piece of steampunk jewelry, these pins come in a wide assortment of varying shapes and sizes, ranging from classic pins modeled after real-world analogues to stunning examples of wholly unique Steampunk styled decorations! 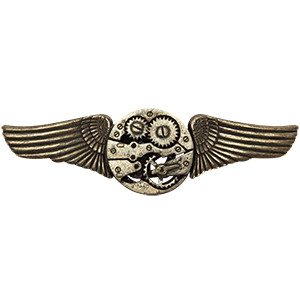 And like any good piece of steampunk adornment, these steampunk pins all feature amazing levels of industrial design, possessing accents of propeller props, gears, cogs, cranks, watch movements, and more! Some of these pins look like military medals, designed to celebrate pilots, while other steampunk brooches are stunning combinations of industrial design and Victorian style. A key brooch, made up of pistons and gears, would be a great way to decorate your lapel, sleeve, or even your hat, while a darter dragonfly pin made up of gear boxes and mechanical parts would be the perfect touch of beauty to any ladys attire. For men and women both, we have the steampunk brooches and pins you will need to add that last touch of industrial style to your steampunk costume. Adding a touch of steampunk flair to your ideal outfit just got easier, thanks to our steampunk buttons and cufflinks section. Here, you will find both steampunk buttons as well as steampunk cufflinks, both of which are perfect for adding that esoteric and eccentric, yet amazingly appealing touch of personal style to a wide assortment of garments. Our steampunk buttons are the perfect replacements when you are looking to turn any everyday shirt into a steampunk shirt, whether you are adding or replacing buttons on either the front of the shirt, the side of the shirt, or even to the sleeves and cuffs! We offer various sets of gearwheel buttons in various sizes and colors, ranging from polished silver to antique bronze, ensuring that there is a button style and a button size for your need. We also offer steampunk cufflinks, which are designed to work with shirts and jackets that feature no buttons on the cuffs. Small in size yet potent in appeal, a good cufflinks is a classic decoration that is perfect for any gentleman or lady to add an additional spot of personal style to their attire. Ranging from all-seeing eye cufflinks that are bound to catch attention to simple yet decorative gear cufflinks, all the way to surreal and strange miasmatic reactor cufflinks that are supposed to purify the air around you, we have the eccentric and the wild cufflinks that will make your formal attire truly unforgettable. Interested? Then keep on looking through the steampunk buttons and cufflinks section and let your mind run wild with the customization possibilities. Shop here for steampunk necklaces and pendants for every occasion, and more importantly, for every profession! In a world powered by steam and inhabited by all manner of amazing little gadgets and gizmos, why settle for just a pretty necklace when you can have a pendant that looks great and allows you to navigate, communicate, or anything else? Here you will find exactly that in many of our steampunk necklaces, as well as so much more! Many of our steampunk necklaces look like working pieces of steampunk technology, especially given how many incorporate pieces of steampunk tech, including things like gears, cogs, cranks, pistons, and other pieces of machinery, into their design. Some of our steampunk necklaces are complex gadgets that look like they belong around the neck of a steampunk inventor or a steampunk surgeon, while other steampunk pendants are stunning displays of industrial ingenuity and Victorian elegance fit for anyone to wear. Sometimes simple, sometimes complex, sometimes eccentric and esoteric, but always wondrous and wonderful, our lineup of steampunk necklaces and pendants is as diverse an array of gizmos, gadgets, and personal adornments that anyone could ask for, offering a wide range of eye pendants, small steampunk tools, gear necklaces, cog pendants, ingenious creations, and Neo-Victorian accessories that are absolutely perfect for virtually any situation. Steampunk jewelry is well-known for its eccentric design and its inclusion of gears, cogs, cranks, and other pieces of machinery, and when it comes to the steampunk rings here, they do not fail to deliver an impressive and eclectic style or a great level of detail, which renders each one an impressive work of steampunk ingenuity. Our steampunk rings come in all shapes and sizes, ranging from classic combinations of gears and cogs that are displayed on a simple yet attractive band to impressively complex and ingenious steampunk contraptions that will catch your eye and hold your stare for minutes at a time! Some of our steampunk rings feature a distinctive Victorian style, touched with hints of new designs and industrial steampunk elements to create something that unique and appealing, while others are wholly steampunk creations that are as impressive as they are visually complex. We have all-seeing eye rings that come in both organic and automaton, as well as clockwork rings that feature gears, cogs, and actual watch movements! We even offer a few ingenious steampunk tools that are perfect for the steampunk explorer or adventurer to keep on their person, ensuring that they are always prepared for any situation, ranging from combat cannon rings to portable fermonic field detectors, all the way down to wireless telegraph tappers! 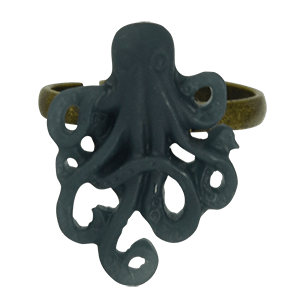 We literally offer some type of ring for everyone here, so take a breather from your mundane, everyday life and get lost in the magnificent and ingenious world of steampunk, as you browse our steampunk rings section for just a little while longer. Ah, the pocket watch. It was once a staple of fashion that all men carried, as much for reasons of style as for being able to tell the time at any given moment. And with its Victorian, old-world style and influence, the pocket watch has again become standard fair for men of a steampunk setting. No longer are pocket watches the providence of just men, though, as our steampunk pocket watches here are suitable for both men and women to wear and enjoy. 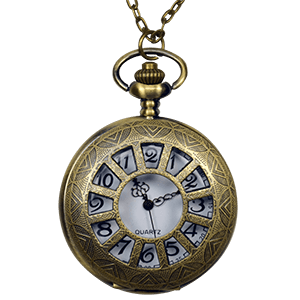 Our steampunk pocket watches come in a variety of different styles and sizes, ranging from the traditional pocket watch size to smaller, allowing for miniature varieties that are perfect for use as decoration. Some of the watches are simple, possessing an antiqued, metal appearance that is ideal for casual use, while others are impressive examples of steampunk style, depicting an assortment of steampunk designs and technological infusions that render the more complicated watches into works of industrial art. Also be aware that some of the watches are purely decorative, meaning that they are designed to resemble a watch and are actually non-functional pieces, while others are completely functional. Each watch will state whether it is a working watch or just a decorative model. Looking to accent your Neo-Victorian style? Nothing quite does it like a nice steampunk pocket watch, worn in the traditional fashion.